It was a tragic end to the year 2015 for the people in Lazu village. Some 30 houses in Lazu village were reduced to ashes in a matter of minutes on 31 December 2015 due to an accidental fire. When the whole world was preparing to welcome the New Year with new hope and dreams, all the hopes and dreams of the people of Lazu village came crashing down with the massive fire accident on the New Year’s Eve. 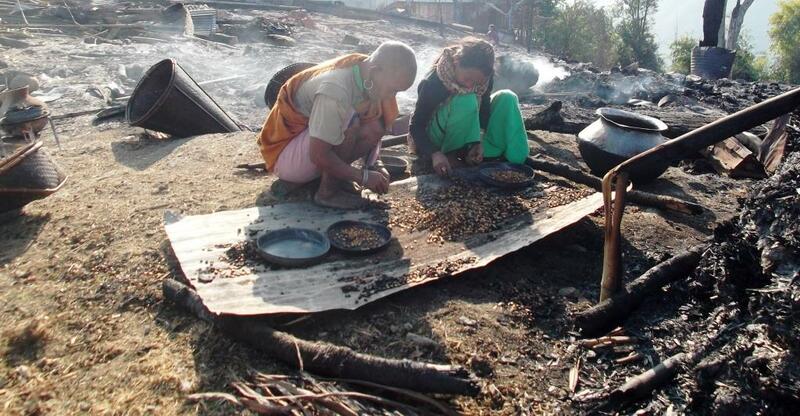 Due to an accidental fire, 26 houses in Lazu village, bordering Myanmar was completely guttered and 13 houses were partially burned down. Stench of smoke mixed with gloom engulfed the whole Lazu village. The New Year joy on the faces of the people soon turned into gloom and tears. It was heart wrenching to see the people react to their hopes turning into ashes. What was once their house was became a heap of ashes; what was once their grains stored for the year ahead became smoke; and what was their hope once went up in flames in seconds. Seva Kendra Arunachal East (SKAE), the Social Service wing of the Diocese of Miao acted at once to respond to this crisis. Sr. Rincy, the Director of SKEA visited Lazu on the same day with basic commodities like blankets, mats and vessels for cooking and took stock of the situation. Fr. Joy MoC, the Parish Priest of Lazu and his collaborators were there with the people in this moment of great crisis. Their presence among them was a big source of comfort for the people.